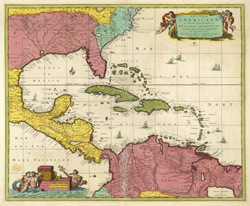 This early 18th century map of the West Indies was produced by Nicolaes Visscher II who was the grandson of celebrated Dutch map maker Claes Jansz Visscher. It was originally published in c.1690 in his Atlas Minor but this is a reprint of c.1717 by Pieter Schenk. It is a typical elaborately decorated Dutch map and the colouring of the islands is decorative as opposed to functional.